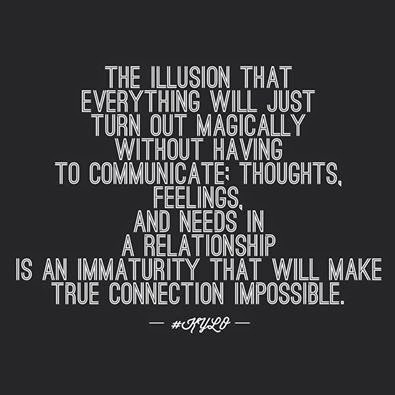 In this day and age of high divorce rates and generally delusional people going around looking for their fairy tale happily ever after, it seems like people just don't know how to communicate with each other anymore. We're all mesmerised by what we see on TV, in movies and in magazines that we have "forgotten" how to really be open and intimate with someone. Instead, we look for passion, romance, the "perfect partner", without fully understanding what that means or where our desire for these ideas comes from. It's all about physical appearance and superficial charms and wit now - there is very little honesty in our social world. So when everyone has a fantasy about what relationships should be like, what happens when they experience the difference of what it's really like? Most of the time people will move on to the next "flame" looking for excitement and passion, not bothering too much about changing their expectations. Sometimes people commit to long term relationships which end up being unsustainable simply due to the lack of open communication between the partners. It's actually a really sad situation - something as empowering and supportive as a lifelong partner to support you has been turned into just another fast-food, instant gratification industry, leeching off of human ignorance. How does this problem manifest in a person's life? Firstly, the lack of communication would trigger conflict when the 2 partners are not on the same page, often misinterpreting each other and misunderstanding each other, which often leads one or both partners to take things personally and then create an emotional reaction to the other, which builds over time and eventually becomes a big ball of resentment, rage, hurt, blame, guilt and so on. This could be avoided by having open discussions to clarify points for each other, clearly explaining each partner's perspective, starting point and understanding of the topic so that both know exactly what the other person means. This also requires that both parties practice discipline over their emotions so that the conversation does not escalate into a shouting match, but remains a "rational" and open discussion that's goal is mutual understanding and does not involve any judgement or blame. As simple as that sounds, it's often a little more difficult to put into practice because, as we all know, sometimes our emotions overwhelm us. But, like so many other things in life, practice makes perfect and the will to move through a point is just as beneficial to the relationships as remaining calm and patient with each other. Beating yourself up or blaming your partner when you hit a hurdle will not help your situation, the better course of action would be to take a deep breath and start again. Obviously there are 2 further important ingredients here: forgiveness and humbleness. You must be willing to forgive yourself and your partner to really give your relationship (and yourself) the best opportunity to develop into something you will enjoy and benefit from; and just as importantly you must be willing to recognise when you have made a mistake and take responsibility for it by apologising to your partner. This is just one dimension of relationships, but it is a big one and a good place to start if you have found a person you want to commit to.